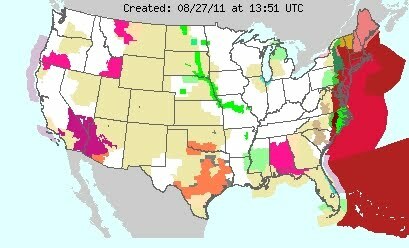 Readers from the eastern seaboard are reporting some of the goings-on as Hurricane Irene tracks toward them. One reader wrote: I live in Maryland. We can count on getting hit with the remnants of a Hurricane about once a year or so. / I went to the grocery store this morning at 8 to pick up more canning lids and the store was already wiped out of water and toilet paper. The bread aisle was being restocked while I was there, as was the milk. / I was out and about again at noon, and the lines at the store were phenomenal. Cars parked over a mile away and people were hoofing it in to the grocery store. The parking lot was gridlocked. / We live far enough away from the shore that our biggest concern is a power outage. / I pray for the folks on the Eastern Shore of Maryland. Lots of Low-Lying areas and high tide is scheduled to hit at the same time as the worst of the storm; Sat. at 5 p.m. The losses are going to be phenomenal. / Stay safe, everyone! Another reader wrote: I live in Southeastern Virginia, and we'll be getting hit tomorrow sometime between 2:00p and 6:00p as near as we can tell. / As the previous posters mentioned, the stores are being stripped right now, and gasoline is getting more difficult to find. At lunch today I was out and about to: (1) pick up a few not really needed items, because I wanted to (2) get a sense of the level of desperation of the non-prepper population. The local BJ's Wholesale store had very little in the way of bread, batteries, bottled water, and whatnot left on the shelves. Also, their filling station ran out of regular gasoline and the manager said the trucks couldn't get down to our area because of the heavy evacuation traffic. All in all, though, everyone seemed to be keeping a level head. / But really, this week has been one for the record books. Tuesday we get an earthquake. Saturday we get a hurricane. I'm guessing that on Sunday, while we're still out of power, the locusts and frogs will hit. Maryland here also. I am in good shape and can't wait for the power to go out. I don't think it will be anymore than a thunderstorm and some flooding in areas. Sorry for them but what can I do. I won't be sweating the bad decisions of other folks. I find it crazy insane how the government has to call for mandatory evacs all because a bunch of idiots chose to live in a bowl and ride out a cat 5 hurricane that was predicted days and days in advanced. Then expect everyone else to rescue them. How much money is this thing costing already broke states? I think if they would start holding communities as a whole responsible for themselves and those within that community people would surely make better decisions about where and with whom they choose to live. I am just sitting back and waiting for the opportunity to work my preps and take notes. We're getting hit with some of the stronger inner middle bands of the storm now. We're about 60 miles from the eye. The continuous rain bands started dropping 1/4 inch/hr during the night and has intensified to dropping a half inch an hour this morning. The winds are gusting to 45-50mph thus far, inland, and the cold rain is coming in sideways. Travel on the interstates is sparse and slow due to hydroplaning. Trucks have halted until this rapidly worsening situation passes through. Downed trees and limbs in the area, falling onto power lines is becoming a problem. The utility crews are roving in a ready to respond mode. There was a long contingent/caravan of huge mil. gensets on trailers headed up the eastern corridor yesterday. I guess headed up to DC and NY. Fuel is readily available and has not been inflated in prices. The grocery store shelves in the convenience stores for bread, milk, & ice are pretty much empty. Our livestock are secured and so are we. Yesterday we took advantage of the incoming rain and finished overseeding and roller packing down the seed over the spent grain fields in anticipation of this much needed rain. Thank you sincerely for keeping us in your prayers. I live about 90 miles west of the storm track. We're getting wind gusts to 45-50 mph and a lot of rain. Found out I had some loose siding this morning as it came off. No problem, just a pain in the rear. This has been more like a drawn out thunderstorm than anything else. Hurricane Isabel was much worse where I'm at! I'm thankful that Irene weakened as she got here! I've only been prepping for about a year, but have made significant strides. All I had to do yesterday to prepare was secure things in the yard that could blow away. I went to Mom's house and helped secure her house. It was amazing to me how frantic and slightly panicked people seemed to be! I was absolutely calm, no pressure at all. I had food, water, shelter and backup plans if needed. It's good to be prepared, really lowers the stress level! I often wonder why more people aren't prepared. Power went out for about 20 minutes. A fair amount of rain, with some high wind. We get worse thunderstorms. Of course the violence of our thunderstorms used to scare the first European settlers to no end. This brings up the critical survival guestion of: When the power comes back on, which color of laundry do you do first? We survived Irene! We live about 45 minutes from the coast near Wilmington NC. Thank you LORD! Bread, water, ice, milk and any canned item the store has always goes. It's total chaos. Having a *preppers mindset* with these kind of storms is a must unless you like dealing with the crowds and insanity. Just getting the outer bands starting to come in here in Northern Virginia. Sure glad I had a stockpile and emergency supplies so I didn't have to go into the chaos of the grocery stores yesterday. Stay safe everyone! Quick update. Almost 300,000 customers without power in my area already, but mine is still on for now. Tidal flooding is looking like it's going to be a bit worse than projected, perhaps just as bad as Isabel in 2003. Already a few deaths, tree-related, one a farmer checking on his animals. I'm only about 2 miles from the coast, and I live on a salt marsh/river, so we're getting pounded pretty bad and the worst of the storm is still six to eight hours away. I guess I'll put the chickens in the garage when the water comes up into the yard. Wish me luck. Having lived in Fla for 40 years I am well acquainted with preps, but it still shocked me how many were NOT prepared. Downright scarey. You just don't "mess" with the NWS predictions. If you are fortunate, it's a lot "less" than they predicted, and you can thank Heaven and go on. If it's as bad, well, you are ready. I did get caught once without enough preps, learned my lession, and did not repeat. Even up here in IL, I prepare. I don't want to be an ostrich. I'm too far away to even get a drop of rain ...unfortunately. But I weathered many a storm in the 20 years I lived in the Houston area. We still lived down there during Katrina and Rita. I don't miss it! I say WHITES, of course! Unless your underwear is not white. Let's face it, less than pristine outerwear is to be expected after an ordeal like a hurricane or other natural disaster. But when you're trying to get back to normal, nothing beats a drawer full of clean underwear! Prayers up for our peeps in the path. Be safe and stay ready. Checking in from Delaware here. Just read that the NWS has updated the track of the storm and that it will be within 10 miles of Fenwick Island, DE (downstate from us) around 2am Sunday. We have been getting steady rain and moderate wind since about noon today and the closest town to us in MD has areas without power. Most bridges in Delaware have been closed or will be closing soon due to high winds. All of the students at the University of Delaware were told to not move in or to drop their things and go back home, but not many of them listened, so we have a large contingent of freshmen living away from home for the first time that are very unprepared for this. Between the locals scrambling to prep at the last minute and the college students the grocery store shelves were bare. We took our kids to college last weekend and would never have dreamt of leaving them in a new place with a natural disaster looming. There were several gas stations that ran out of gas and didn't have any deliveries on the way. Fortunately we are prepped and didn't need to go to the store and had already gassed up the vehicles before anyone else started to panic. We are just sitting tight and praying that the wind and rain don't cause us to get any water in our basement. Irene is over for us, with the exception of the occasional gusts. Lots of rain, lots of limbs and leaves all over, but no trees down. No thunderstorms, etc. This is the first hurricane since I officially became a "prepper" and it totally shocked me. There was almost nothing left to do. We were able to spend all of our time getting our animals set and taken care of. We gassed up the cars midweek. The only thing left for the last minute was to purchase a cooler full of ice and draw up lots of water for the stock. Wow, what a stress-free way to live. The Righteous have nothing to fear. Place your Trust in the Lord. We are wet and smiling. Something smells fishy about this hurricane. Any people in the East Coast area of the hurricane are you taking your own wind readings or just relying on Weather reports from News/NOAA. If you go to the weather underground at www.wunderground.com the wind speeds aren't consistent with a hurricane as of 10pm central time. Based on the political coverage about President Obama and Mayor Bloomberg it seems like much ado about nothing. Tropical storm maybe, apocalyptic hurricane? Hardly. Survived the storm with just a small water spot in the kitchen. No trees down, no loss of power. Lots of flooding in the usual areas, but that happens any time that it rains hard. Just finished about seven hours of taking care of the fallen trees on our property, but didn't lose a shingle! God is so good. The winds were really bad as was the rain but we survived. We started preparing on Tuesday. Got gas for the gennie on Wednesday and was able to completely avoid the paranoid, chaotic rush of the unprepared. Even had a game and puzzle for dear son for when the power went out. What peace I had as we waited for the storm! I love to read success stories from preppers who went through a disaster and came out completely unscathed or relatively so. But what I'd like to know is this: was there anything you wished you had but didn't? For example, did you wish you had a more powerful flashlight or a larger tarp to cover the firewood pile or a better way to communicate with your neighbors? IOW, your good and not-so-good experiences can be very helpful to the rest of us. Thank you in advance.